In this episode I would like to explain how we call GET method of SAP S/4HANA Cloud API from SAP API Business Hub. For complete utilization of information present in this blog, it is recommended to go through my earlier blogs as part of this series if not done already. In our example here, we will fetch a list of top 10 Purchase Orders from SAP S/4HANA Cloud system by putting a filter criteria using GET method. Lets have a look at the steps to achieve this. Note: Every API might be having multiple entities in it. Hence based on our requirement we have to select a relevant entity. Note: We can even leave all parameters blank, in case we want to retrieve all values. This will fetch details of a given Purchase Order as result. We are now successful in reading the details of ‘Purchase Orders’ from SAP S/4HANA Cloud using API via SAP API Business hub. 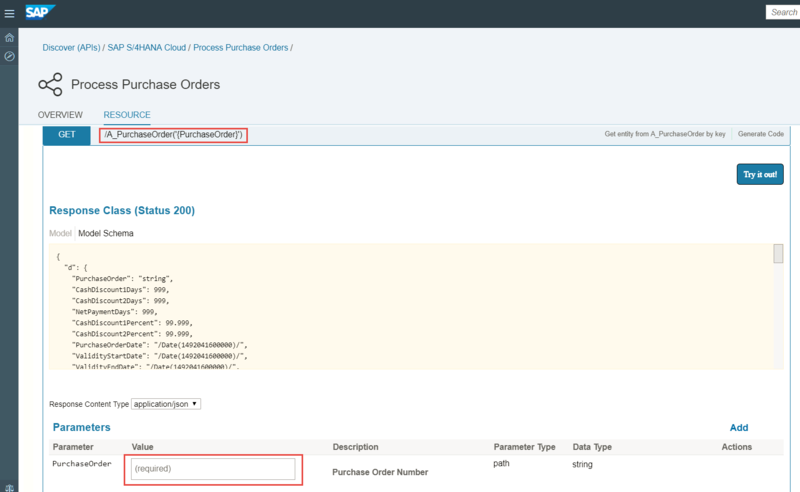 In my next blog I would explain the steps to create a Purchase Order in SAP S/4HANA Cloud using API, triggered from SAP API Business Hub. Disclaimer: This blog is based on SAP S/4HANA Cloud 1711 release.